How Ted Cruz's Father Shaped His Views On Immigration : It's All Politics The Texas senator says giving a path to citizenship to immigrants in the U.S. illegally would be unfair to immigrants who followed the rules, like his own father, 74-year-old Rafael Bienvenido Cruz. He portrays his dad as a kind of Cuban Horatio Alger. Ted Cruz celebrates his victory in the Texas Senate race with his father, Rafael, and daughter Caroline on Nov. 6, 2012, in Houston. As the Senate debates a massive overhaul of the nation's immigration laws, one of its newest members has emerged as a leading opponent of the bill's most controversial feature: a path to citizenship for millions living in the country unlawfully. The views of that freshman senator — Texas Republican Ted Cruz — have been significantly colored by the saga of his own father, an immigrant from Cuba. "In my opinion, if we allow those who are here illegally to be put on a path to citizenship, that is incredibly unfair to those who follow the rules," Cruz has said. And the example he frequently points to is his father, 74-year-old Rafael Bienvenido Cruz. "I came to this country legally," Cruz's father says. "I came here with a legal visa, and ... every step of the way, I have been here legally." In an interview near his home outside Dallas, the elder Cruz says that as a teenager, he fought alongside Fidel Castro's forces to overthrow Cuba's U.S.-backed dictator, Fulgencio Batista. He was caught by Batista's forces, he says, and jailed and beaten before being released. It was 1957, and Cruz decided to get out of Cuba by applying to the University of Texas. Upon being admitted, he adds, he got a four-year student visa at the U.S. Consulate in Havana. "Then the only other thing that I needed was an exit permit from the Batista government," Cruz recalls. "A friend of the family, a lawyer friend of my father, basically bribed a Batista official to stamp my passport with an exit permit." The Rafael Cruz that his son Ted portrays is a kind of Cuban Horatio Alger — arriving in the U.S. with only $100, learning English on his own and washing dishes seven days a week for 50 cents an hour. "Since he liked to eat seven days a week, he worked seven days a week, and he paid his way through the University of Texas," Ted Cruz says of his father, "and then ended up getting a job and eventually going on to start a small business and to work towards the American dream." Only he did that in Canada, where Ted was born. His father went there after having earlier obtained political asylum in the U.S. when his student visa ran out. He then got a green card, he says, and married Ted's mother, an American citizen. The two of them moved to Canada to work in the oil industry. 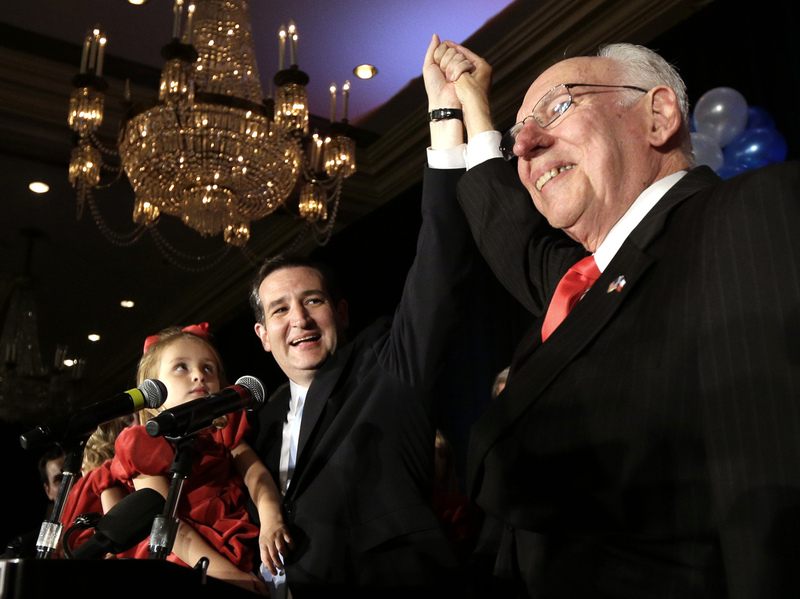 "I worked in Canada for eight years," Rafael Cruz says. "And while I was in Canada, I became a Canadian citizen." The elder Cruz says he renounced his Canadian citizenship when he finally became a U.S. citizen in 2005 — 48 years after leaving Cuba. Why did he take so long to do it? 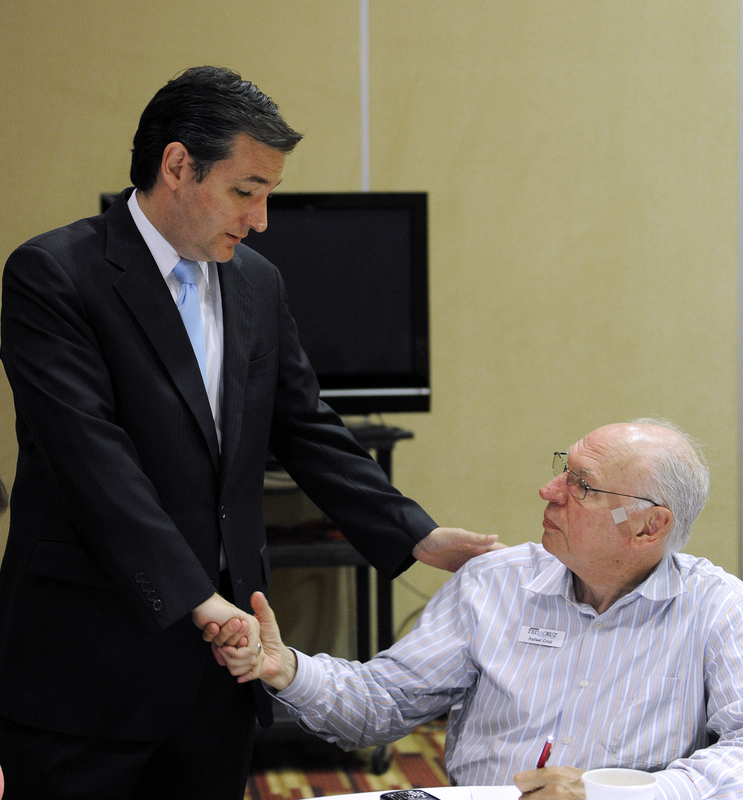 Ted Cruz talks with his father, Rafael, on the day of the GOP primary election in May 2012 at the campaign's phone bank in Houston. "I don't know. I guess laziness, or — I don't know," he says. Peter Spiro, a legal expert on U.S. citizenship at Temple University, says Rafael Cruz followed "sort of a zigzag path to citizenship." Spiro says Cruz's multicountry odyssey did not follow traditional models for immigration. "Ted Cruz himself seems to be an advocate of those traditional immigration models," Spiro says. "Maybe he should be a little more tolerant of the nontraditional versions, given his own father's history." And yet Ted Cruz wants to change the immigration bill with an amendment removing the path to citizenship. "The 11 million who are here illegally would be granted legal status once the border was secured — not before — but after the border was secured, they would be granted legal status," he says. "And indeed, they would be eligible for permanent legal residency. But they would not be eligible for citizenship." And they would thus be ineligible to vote. Such immigrants would most likely vote Democratic — and Texas Democratic Party Chairman Gilberto Hinojosa says that's the real reason Cruz opposes a path to citizenship. "All these specious arguments that are being made about, 'Whoa, my dad got in here the right way and, therefore, everybody else should' are just — are bogus and everybody knows that," Hinojosa says. Speaking Wednesday with conservative radio host Rush Limbaugh, Ted Cruz said that by promoting what he called "amnesty" for immigrants in the U.S. illegally, Senate Democrats are indeed hoping to get a lot more Democratic voters — but not among immigrants who did things the right way, like his father.